house distribution needs. Gaming, internet, computer, TV, movies and so on. Item 36: $29.95Can or $22.19us per pair Brand New. 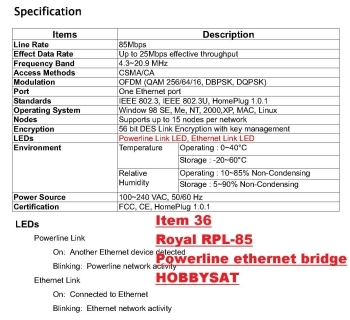 Royal+ RPL-85 HomePlug 85M Powerline wall mount ethernet bridge 2x. convenience to your digital network environment. Retail Price: was $99.95, then $69.95. We discount to $29.95. Gaming simply connect the second adapter to an Internet-enabled device, plug it into any outlet, and start streaming. 1x bridge or cable in 1x plastic bag (2 sets, 4 bags). Shipping Weight: 150 grams 5.2 ounces. 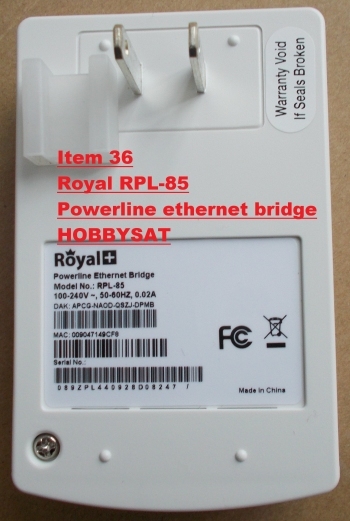 Get a Royal+ RPL-85 HomePlug 85M Powerline adapter for your media stuff throughout the house. 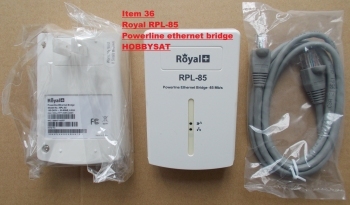 Get a Royal+ RPL-85 HomePlug 85M Powerline Adapter for Skyping and Video Calling/Chatting. 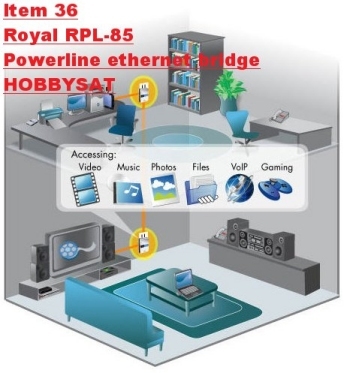 - Wall mountable powerline bridge design (no floor/desk space required for structuring home network environment). - Provides variety of networking applications. 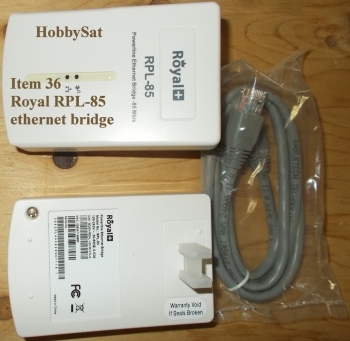 - Share multiple Ethernet devices at home with a single adapter (RPL-85). - Speed - fast data transfer rates up to 85* Mbps PHY data rate. - Multiple high definition IP video streaming. - Integrated Quality of Service (QOS), four-level priority based contention access. - Low power consumption (idle mode operation power consumption less than 2.0 Watts). 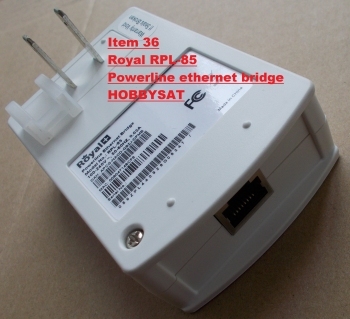 - 56 bit AED data link encryption mechanism for high security. - Co-existence with HomePlug 1.0 and HomePlug Turbo. Temperature conditions: Operating: 0°C to 40°C, 32°F to 104°F. Storage: -20°C-60°C, -4°F to 140°F. Humidity: Operating: 10%-85%, non-condensing; Storage: 5%-90%, non-condensing. • Frequency Band: 4.3-20.9 MHz. • Power Source: 100-240VAC, 50/60Hz. I am happy with the product. It does what it is supposed to do. Giorgio Korplis February 20, 2016. Halifax.